Nature gave me four of the five layers in this image, and ten passionate nature photographers gave me the fifth. 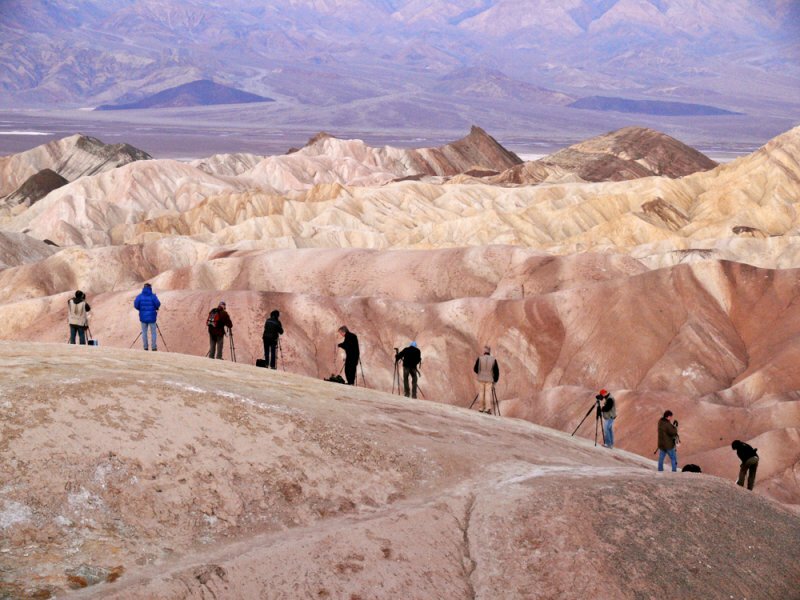 Every day, ten to twenty photographers carry their tripods up to the top of Death Valley’s most visited overlook at Zabriskie Point to await the coming of the light. On this winter morning, an icy wind chilled the rocky surfaces, but these photographers never flinched. They not only were about to make their own pictures, but they helped me make mine as well. I use the large curved dome of smooth rock as my foreground layer – including the long diagonal path rubbed smooth by generations of serious landscape photographers. The gently curving arc of ten photographers in various stages of preparation and wearing contrasting colors create my second layer – they are my subjects and the view from Zabriskie Point is the context. The third layer is a pair of pink ridges; the fourth layer offers a mass of merged ridges that carry the eye to the valley of the Amargosa Mountains. The final layer is the valley itself, reaching out to the foothills at the very top of the image. Thanks, Sofia. Yes, the line of photographers bends just as the landscape their are photographing bends, making them an integral part of the landscape they are photographing. As Jenene points out, they are caught in a moment of suspended animation, and that is the essence of expression here. There is a sense of rhythm in that line of people, Jenene -- that is what gives this image its feel of suspended animation. Photographers themselves suspend time in the very act of photographing. So what you see here is certainly appropriate to the subject at hand. I love Cecilia's analogy. My eye immediately swept the diagonal and my first thought was of the old flip style animation books, where the image changed only slightly with each page turned. The progression of movement is animation at it's most basic. The vista and its multiple layers are not insubstantial, but for me, it's the line of photographers looking for 'their' shot that gives this image it's expression. I love the way you see this image, Ceci -- fat eyelashes on a huge eye is a wonderful phrase. And I like the way you contrast the living to the inert, and then to now. I like this shot so much! Ten people lined up like fat eyelashes on a huge eye, along a ridge, trying to capture inside tiny boxes eons of spectatularly sculpted rock and earth and vistas, crevasses, ravines, layers -- while you back off and captured THEM. Such a strong constrast between these humans and the resting mountains in the distance, lying like creatures from another time in silence and stillness.